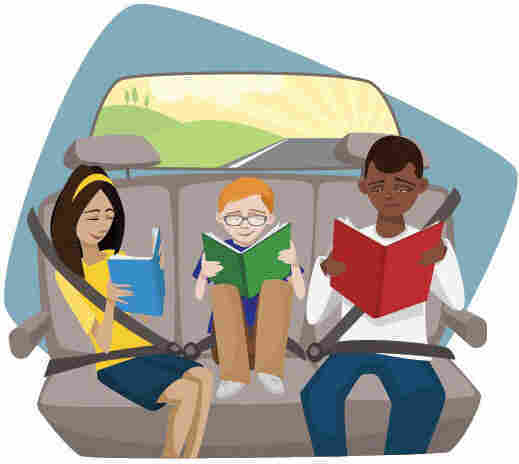 Welcome to the first installment of NPR's Backseat Book Club! We've invited all of our younger listeners to join us for conversations with authors of kids' books. 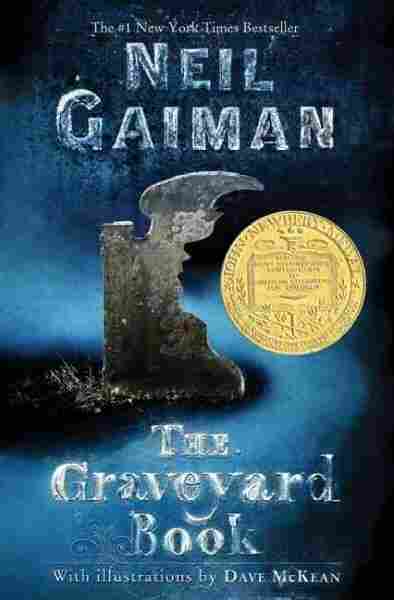 We kicked off the club with The Graveyard Book, a thrilling Halloween treat from Neil Gaiman that won the Newbery Medal in 2009. Gaiman loves Halloween and all the creepy fun that goes along with it. "I think Halloween is the best possible festival celebration of any kind," he tells NPR's Michele Norris. "I love ghoulies and ghosties and long-legged beasties, and things that go bump in the night." But just because Gaiman loves Halloween doesn't mean he loves horror — he'll write horror, he says, but only in moderation. Book club member Sarah Matthews, 14, wrote in to ask Gaiman how he made such a dark and creepy subject feel so approachable. "I'll tend to use horror as a condiment," he explains, "in the way that you might add salt or ketchup to a meal. You just want to add a little to make it taste a little bit better, but you definitely don't want a meal that's all salt or all ketchup." It's a murderous knife — one that has just killed the family of the protagonist the readers are about to meet. Gaiman was convinced this was not too much for kids, and that they would keep reading. "[I] wanted to make it very, very scary upfront, because it's never that scary again," Gaiman says. And it's not. The young boy who escapes the knife toddles his way into a graveyard, where he's raised by ghosts. 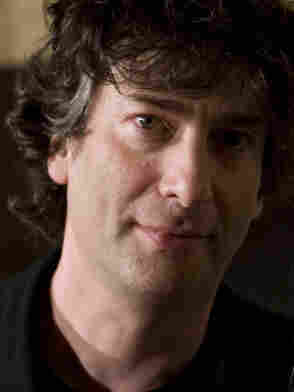 Neil Gaiman is also the author of Coraline, American Gods, Anansi Boys,Stardust and M Is for Magic. He was born in Hampshire, England, and now lives near Minneapolis. You can follow him on Twitter @neilhimself. I fail appallingly on Halloween ... because my house is just a little bit too big and spooky, and just a little bit too far outside of town. It looks like an Addams Family house. When I moved to America almost 20 years ago, I was so excited by Halloween — I decorated the house Halloween-wise, and I went out [and bought lots] of candy, and I waited for the children to come, and nobody came. Book club member Amelia Herron, 12, from Manchester, Mich., was curious how Gaiman might describe The Graveyard Book to someone who had never heard of it before. Gaiman says he'd describe the book as eight short stories — each story taking place two years after the story before it. It follows the first 16 years of the life of young Nobody Owens — his friends call him Bod — who takes refuge in a graveyard after his family is killed. And though he's raised by dead people, Bod learns the value of life. 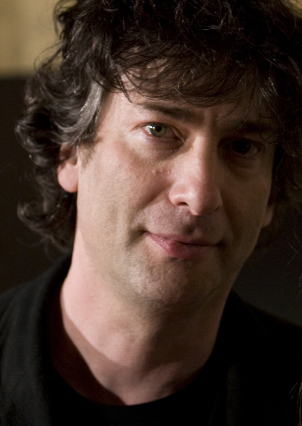 "In many ways, for me, The Graveyard Book was a book about life," Gaiman says. "Because you can talk about life and community and family in ways you might not have seen them described before." Anna Jaffe, 11, from Cleveland, is reading the book along with her friend Sadie. They wrote in to say that their favorite character in the book so far is Silas — and wanted to know which character Gaiman liked best. Turns out, Silas is Gaiman's favorite, too. "Writing Silas — who's not really alive and isn't really part of the Graveyard — was enormously fun for me," Gaiman says. "I think my favorite of the minor characters was probably a poet named Nehemiah Trot, just because writing his language was so much fun." Many book club members said that they felt a strong connection to Bod and were curious to know what happens to him after he leaves the graveyard and enters the world of the living. But that's not a question that Gaiman wants to answer for his young readers. "You should be continuing the story in your head when it's done," he says. "You should close that last page, but the characters keep on living. I love talking to young readers who have their own ideas about what happened to Bod after the story is over. ... Everything you need to know for the book is there in the last few pages. He has adventures." Clarivel Ann Dinh from Ventura, Calif., was curious to know whether Bod would return to the graveyard when he died. "I hope so," Gaiman answers. "It would be a good thing if he did. I think he'd really like that. ... The graveyard is his home and it's his childhood home, but I think he realizes that there comes a point — and everybody in the graveyard knows — there comes a point where you cannot keep a child in his or her childhood home anymore. You have to go out and have your adventures ... explore ... and discover life." Next Month's Book Pick: In November, NPR's Backseat Book Club will read The Phantom Tollbooth, written by Norton Juster and illustrated by Jules Feiffer. The book was published in 1961 and five decades later, the story of the bored little boy named Milo who travels on a journey to the Lands Beyond still feels fresh. Read the book and join the conversation! How did you come up with the ideas for the odd names for the characters in the story? — Michael Curtis, 11, York, Pa.
Truthfully, a lot of the best names in the book I actually got from headstones. Because of one of the things I tended to do while writing and researching The Graveyard Book is, I would go to graveyards, and just go and wander around there. I'd have tours of some of the great graveyards in the world — some in New Orleans, there's a wonderful one outside Glasgow, in Scotland. There's Highgate Cemetery in London, from which I stole the Egyptian walk that I put into the book. Every now and then, if I saw something on a headstone, a really good little epitaph or something, I would write it down. And I stole a lot of really good names, especially family names and first names, and then I'd sort of mix and match. How did you manage to make such a morose topic so welcoming and light? I love to write stories that have a little bit of creepiness to them, but always manage to over-do it and turn it into a horror story. — Sarah Matthews, 14, Florence, Ala.
Gee, you definitely sound like you're a writer, Sarah ... The most important thing to concentrate on is telling the story. Make it interesting. In the case of The Graveyard Book, I loved turning ideas upside down, but I also loved being very, very honest with kids. When I was a kid, I had to walk past a graveyard every day to get home from school — which was fine in the summer — but in the winter when we had to come home in the dark, it terrified me. I would've been 9, 10, 11 at this point. It never occurred to me that walking past this graveyard, there was absolutely nothing in it that was dead that could hurt me. The only thing that could ever have hurt me in that graveyard would've been something living. So I like the idea of putting that in my book. The idea of the graveyard as a welcoming place, it's a very natural place. You know, people have lived, people die. How old is the Indigo man? — Lindsey Flemmons, 11, York, Pa.
Great question, Lindsey. I'd say the Indigo man is probably, he's definitely very, very much the oldest thing in the graveyard. Probably 10,000 to 12,000 years old. He was there before they were building Stonehenge. I like the idea that if you have the graveyard, you might have something that had been buried a long time ago — almost archaeological, and so he's the oldest thing in there. The film rights to The Graveyard Book have been bought. Things are quietly chugging away in the background. When it comes to movies, I'm always very happy to wait to get it right ... I'm perfectly prepared to wait as long as it takes for a good Graveyard Book movie to come out. A sequel is sort of a possibility, but not in the standard sense of: "Here's the next book of what happened to Bod. .... [But] every now and again, I have ideas for stories of things that happened to Bod during the course of The Graveyard Book that aren't mentioned: ... You learn what happened to Bod when he was 2 and 4 and 6 and 8 and 10 and 12 and 14, and I thought maybe I could go in and occasionally write a story of what happened to him when he was 9 or when he was 7. I think that the other idea that I have in the back of my head is: I would love to do a bigger, stranger, more adult book that kind of begins with The Graveyard Book, in much the same way that The Hobbit leads you into The Lord of the Rings. Lord of the Rings really isn't a sequel to The Hobbit. It embraces it, and it takes it up, and it says: Some of the things you knew ... aren't actually so. I think I might well do one of those, but the trouble for me is always that there are so many books to write and only so much time.